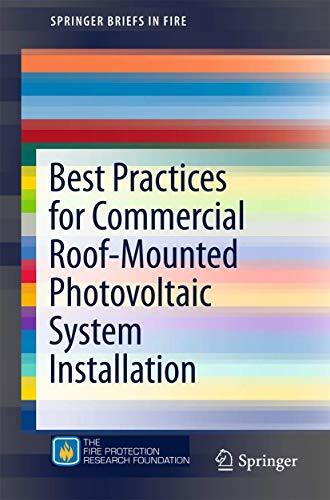 [PDF] Best Practices for Commercial Roof-Mounted Photovoltaic System Installation | Free eBooks Download - EBOOKEE! Description: This SpringerBrief presents information on a wide variety of hazards and the damage potential caused by installation of a photovoltaic (PV) system. The current installation practices for PV systems on roofs create electrical, fire, structural, and weather-related hazards that do not comply to current codes, standards and guidance documents. Potential dangers include structural loading, wind loads, hail, snow, debris accumulation, seismic hazards, firefighting hazards, and electrical hazards. Despite the increased popularity of PV systems after the environmental movement, research shows that the costs of installing PV systems outweigh the benefits. Hazards of PV systems on roofs have caused several incidents in the United States the most notable in Bakersfield, California, and Mount Holly, North Carolina. Designed for fire engineers and professionals, Best Practices for Commercial Roof-Mounted Photovoltaic System Installation offers recommendations to set up PV systems safely and sustainably. No comments for "[PDF] Best Practices for Commercial Roof-Mounted Photovoltaic System Installation".